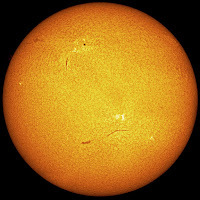 The image below was taken at the University's Bayfordbury Observatory in January by David Campbell using the Chris Kitchin Telescope and a special filter to emphasis a particular transition of hydrogen. It's a mosaic of nine images taken with the Tele Vue 102 (4-inch refractor piggybacked in the CKT) and the Lumenera SKYnyx2-1 from the video dome, using the solar H-alpha filter. It was first broadcast on the Sky at Night on 1st May.